“Caracas, Hecho en Venezuela” (Caracas, Made in Venezuela) is is a series of works realized in Caracas, Venezuela during a 6 month research residency Caracas. The billboard “Caracas, Hecho en Venezuela” is based on an aerial photo of the social housing project 23 de Enero and transferred into the text of the new constitution. The C.H. Scott Gallery in Vancouver showed the series of all works and produced a publication with us, edited by Kathy Slade. 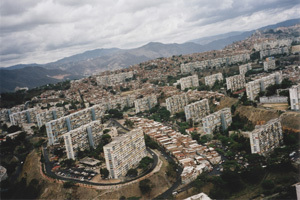 The works are produced as part of CaracasCase, a project of the Federal Cultural Foundation of Germany and the Caracas Urban Think Tank, Venezuela, 2003.